The attenuation channel contains a significant proportion of noisy data. These data should be used with caution. A Sea-Bird Electronics SBE 911plus CTD unit was used. Water samples were collected with a SBE 35 Carousel, which was attached to the CTD frame. The CTD unit included the following sensors. Data were received by BODC in one ASCII format file that was subsequently split into 58 separate files, one for each CTD profile. The series were reformatted to the internal QXF format using BODC transfer function 340. Sample calibrations were applied to the conductivity data. The following table details mapping of variables to BODC parameter codes. Conductivity mS cm -1 Electrical conductivity of the water column calibrated against independent measurements CNCLCCI1 S m -1 Conversion by transfer (mS cm -1 x 0.1). Sample calibrations applied by transfer. Following transfer to QXF, the data were screened using BODC's in-house visualisation software, EDSERPLO. Any data considered as suspect were flagged. Flags from the originator marking suspect data were retained during transfer. 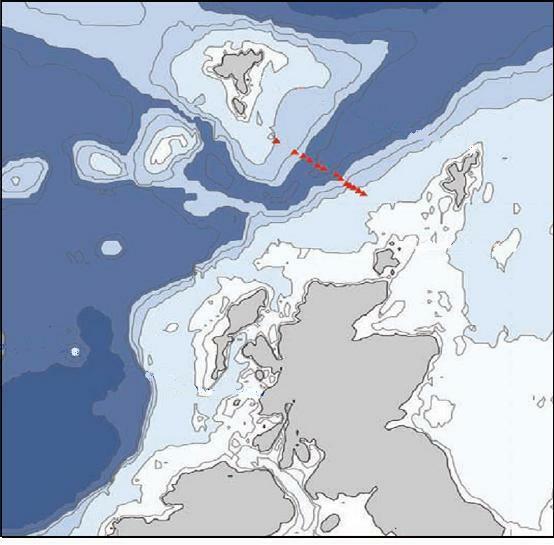 A total of 58 CTD casts were performed on FRV Scotia cruise 1609S (02 December 2009 - 16 December 2009) along the JONSIS, Fair-Isle Munken and Nolso Flugga lines. The data were collected between 16:26 hours on 02 November 2009 and 02:38 hours on 15 December 2009. The raw CTD data files were processed through the SeaBird Electronics SeaSoft data processing software following standard procedures. The originators used in-house interactive visual display editing software to edit out individual spikes in the primary temperature and conductivity channels. In addition, a low-pass filter (Sy 1985) was applied to particularly noisy data. An ASCII file was generated for each CTD cast and all files from a cruise were concatenated into one ASCII file which was submitted to BODC. Independent salinity samples, obtained from the sample bottle and spread throughout the cruise, were used to calibrate the CTD conductivity data. Outlying points were discarded, and 115 data points were used to derive the calibrations. The sample analyses yielded a straight line conductivity calibration of the form y = mx + c, where m=1.000013 and c = 0.003041. Long term monitoring carried out by the Marine Laboratory Aberdeen began in the early 1890's by the forerunner of the laboratory, the Fishery Board of Scotland (est. 1882). The first water bottle casts were carried out during 1893 and conducted by Dr H N Dickson on board HMS Jackal. Four of these stations were to become part of the now standard Nolso-Flugga Faroe-Shetland Channel section. In addition, at positions further south, he sampled at three stations and these were to become part of the standard Fair Isle-Munken section. A full set of stations (12) were first sampled along the Nolso-Flugga line in 1903, and since then have more or less been sampled annually or more except for the war years. Since then extra stations have been added to both sections. Listed below are details of the standard hydrographic stations that form the Fair Isle-Munken line. * FIM-03 - Use 60 20.25'N 004 09.00'W if above position is occupied.